Classroom Language (Bahasa Yang Digunakan Dalam Ruang Kelas) - Classroom Language atau bisa disebut juga dengan bahasa yang kita pergunakan dalam ruang kelas. 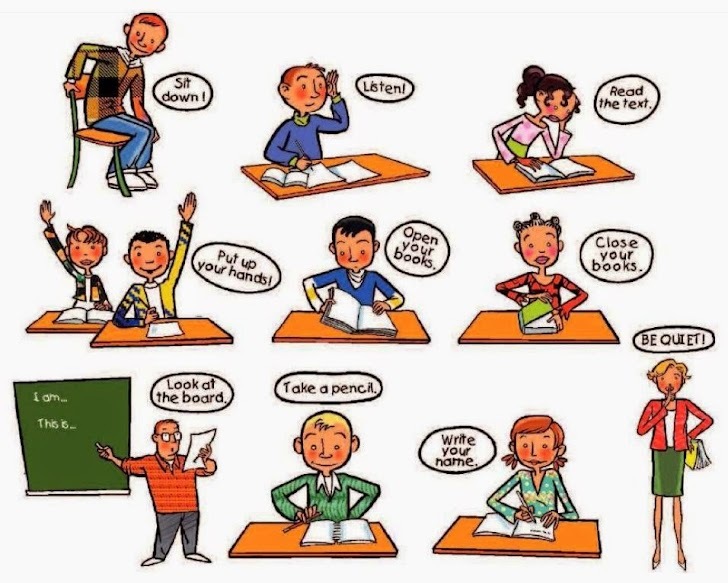 Classroom Language adalah materi pembahasan pembelajaran yang saya pelajari dan disini saya ingin berbagi kalimat/teks yang biasa digunakan didalam kelas. Mari kita belajar dan memahaminya. Let us wrap up for today. Listen to what your classmates are saying. I want everyone to look at the board. That is what I meant. Let me say it again. No daydreaming, listen to your classmates. Can you speak louder, Please? I can't hear you. Please pronounce each word slowly. Go to active conversation/writing connection. Please compleate this section/part in 5/10/... minutes. Repeat each word after me. Exchange your work with your partner. Exchange your work with the person sitting next to you. Can you check you work again? Mark the work of person sitting next to you. Do you have any questions before we move forward. Can you repeat what I said? That is god but can you repeat it in complete sentence? Do not scream or shout. Take out your text books. Turn over to next page. Now let's get into groups of 6/5/4/3. Can Lana join your group? She doesn't have a group as she came late. Remember, everyone has to participate. Everyone must give his or her input in the discussion. Move around the classroom without making noise. Anyone else wants to try? Come on, dear, you try. That's good, come and read. Come and di it on the board. Good try, but it is not correct. Try again. You are doing it perfectly. What is your opinion? It is OK to share. Those of you who haven't done the homework, please raise your hand. Give me good reason for not doing your work. Please put your homework on my desk. Siti, can you collect everyone's work, thank you? If you haven't done your homework, do it as soon as possible. Good job! that is perfect. Please write your name and class on the test. Read carefully before starting the test. Ask if you do not understand anything. Leave your tests on your desk. Has everyone submitted their tests? Many manny happy returns of the day! Good luck for the competition. I hope you are victorious. Let's recap before we go. Can you summarize what I said? OK class, we will stop here. Let's wrap it for this week. Do you have any questions before we end this class for today? Any questions before we stop? Before we stope, tell me what have you learnt today. Since we finished early, how about we play a game? There are few minutes left, you can check your work again. Saved by the bell, we will continue next week. No time left, Let's continue in next class. OK every one, let's call it a day.